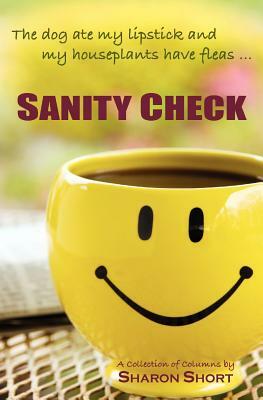 Sanity Check by Sharon Short first appeared in the Dayton Daily News (Ohio) in January 2002. For more than ten years, the column covered everything from shredding pantyhose for stress relief, to the family dog joyfully dancing with flying eggs, to the day Sharon realized she'd lost her lips. Sanity Check's driving philosophy is that we all goof up... but laughing at those goof-ups with each other is a lot healthier than obsessing over them. This collection includes 100 favorite columns of Sanity Check readers. "Years ago, when we were trying to create a local column in the Dayton Daily News' Life section that offered a proper mix of wisdom and whimsy, with a friendly voice and a bright take on the crazy things that can go on in in the world, Sharon Short came quickly to mind. Her "Sanity Check" columns have been making our Monday morning coffee taste better, and our days brighter, for more than a decade now. Those readers who know her from her novels will enjoy getting to know the more personal, witty side of a writer who has true knack for telling it like it is, and making you happy to hear it." Ron Rollins, Associate Editor, Dayton Daily News.